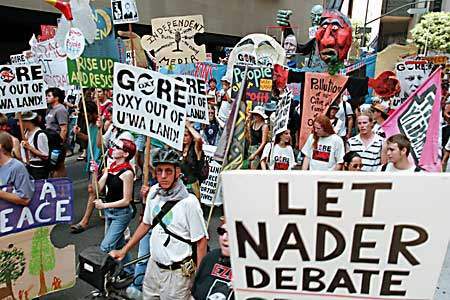 Thousands of demonstrators march through the streets of downtown LA to demand that presidential candidate Al Gore demand that Occidental Petroleum Corporation abort their plans to drill on U'wa Indian territory. Gore has up to one million dollars in Occidental Petroleum shares. The U'wa demand that Oxy not drill on their traditional territory in the cloud forest of Colombia and have threatened mass suicide if Oxy does drill. Copyright 2000 Dang Ngo. Free for use by nonprofit, anti-corporate globalization organizations and for personal use. All other rights reserved.